Dempsey is a 1 year old Boxer mix whose previous owner set him on fire as a pup. He not only survived the incident, thanks to good people in the world, but also his battle with the Parvo virus as his wounds were healing. 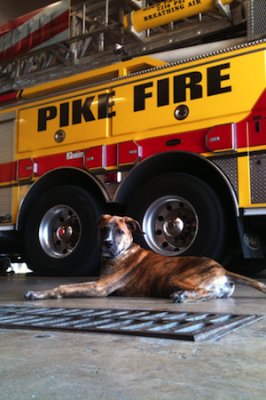 He currently travels with his adopted owner, a public educator for Pike Township Fire Department, to teach children about the dangers of fire. This past spring, Dempsey joined IVEC’s canine blood donor program to give back to other pets in need (each time he donates blood, he saves 2-4 pets!). Due to Dempsey’s large size, his paws need multiple surgeries, which will cost well over $10,000 to reconstruct.